Is step-charging available for renewal billing? Can the PT parameter be returned in notifications? Who sends compliance messages (SMS)? Can we send non-compliance related SMS messages through the Infomedia platform? e.g. Marketing messages. Is there a Subscription API? How is a user's subscription cancelled when they send a STOP type MO SMS? If a user doesn't pay their bill, is their subscription cancelled automatically? Can a subscription have a free trial period? This document provides Partners with the information they need to manage their integration with the Infomedia platform. This will allow Partners to connect to any Mobile Carrier facilitated by Infomedia through our standard Checkout Pages-hosted flow. 1. Infomedia Checkout Pages-hosted user acquisition flow to allow the user to purchase a product or subscribe to a service. 2. Infomedia managing the subscription base, and therefore triggering all billing and compliance messaging. 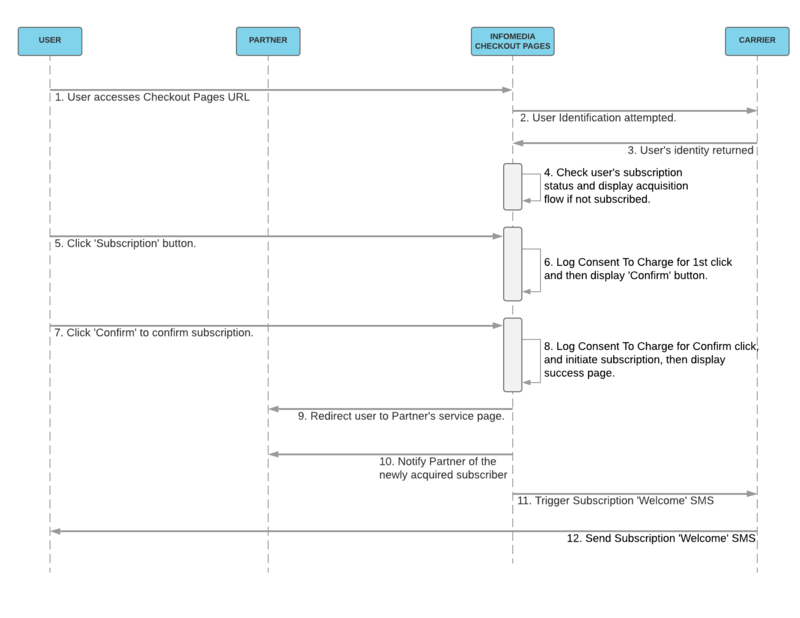 The following sequence diagram shows the basic user acquisition flow through the Checkout Pages platform. Once the user has been successfully subscribed, or successfully purchases a product, they are directed to the Partner's service URL. A user must be passed to an Infomedia-hosted Checkout Pages URL, which will be generated by Infomedia and provided to you for each individual service. Please contact your Technical Account Manager to have the Checkout Page setup and to be provided with the URL. Once you have your Checkout Pages service URL, you can send users to it along with appending a 'PT' (PassThrough) parameter to the URL, which can contain any value in a URL encoded format. This 'PT' parameter will be returned to you in the response. Due to the length and appearance of the Checkout Pages URL domain, the Partner should 'CNAME' to the domain of their choice, over the domain of the Infomedia Checkout Pages URL. This will allow your users to view/access a much shorter and visibly appropriate URL to access the Checkout Pages service. Once the user has accessed the Checkout Pages URL, they will go through a series of acquisition/payment pages, which may all be hosted by Infomedia for some carriers, and in some cases could be hosted by the carrier themselves. In either case, the user will be passed back to the Partner's platform at the end of the flow, either having initiated a subscription/purchase, or having cancelled out of the flow. MX Populated with an encrypted MSISDN or encrypted Infomedia Alias. Success '1' signifying that an acquisition has taken place successfully. PT The pass-through value, if PT was passed to the original Infomedia-hosted Checkout Pages URL. Once the successful user has returned to your platform via the return URL, you will be able to provide them with access to their service. This would be the best time to store the user's details, e.g. MX, MCC, MNC, or possibly have the user create login credentials for your service so you can identify them when they return to your service in the future. For more details please refer to Managing Returning Customers. Subscriptions are managed by the Infomedia platform, and the user's triggering of a subscription takes place via the Infomedia-hosted Checkout Pages flow. The Infomedia platform triggers the subscription and then the user is passed back to the Partner's platform. Ensure the user has been passed to the Checkout Pages URL by following the points in this section. Partner-triggered subscription cancellation: You can unsubscribe a user from a service by triggering the SubscriptionUnsubscribe method of the Mobile Payments API. STOP MO SMS: Users can unsubscribe by sending a STOP MO message which is handled by the carrier. Please get in contact with your Technical Account Manager to setup a keyword and request short code information. One-time purchases are triggered by the user on the Infomedia platform via the Infomedia-hosted Checkout Pages flow. The Infomedia platform triggers the bill and then the user is passed back to the Partner's platform. Refer to section Subscriber Notifications for more information on how to handle these notifications. Refer to section SMS Notifications for more information on how to handle these notifications. To receive these notifications when a user interacts with the Checkout Pages service, please provide your Technical Account Manager with a URL for your notification handler and the notifications will be configured. EngagementID Unique reference for the interaction that has taken place between the user and the service. MCC 3-digit Mobile Country Code. MNC 2-digit Mobile Network Code. PID The ServiceID or the BPID for the Product that the user is requesting. SID ServiceID. Infomedia will supply you with a list of these. PageIdentifier This should be a meaningful reference for the page which would then be used for tracking and identifying notifications. ActionID ID relating to the action occurring on the Checkout Page for which the notification has occurred. AFID Unique identifier relating to the specific Checkout Page service. Checkout Pages services can be configured to utilise Google Analytics to monitor user flow and interactions. Please provide your Technical Account Manager with your Google Analytics TrackingID to have this configured. A customer's first access to a Partner's service is usually straight after the Checkout Pages acquisition flow. Your environment will be able to recognise the customer based upon the MX, MCC, and MNC returned from the Checkout Pages platform. However, when the customer leaves your service page/app and returns again at another time, you may need to identify them again and authenticate them to provide them with access to the service. User detection is required to authenticate a user before providing them with access to a service. You should first attempt to identify the user by using your own methods, e.g. via user login, or checking a cookie/session on your platform. You would want to do this when a returning user lands on your platform and you want to detect them to send them through to their service that they may already have purchased/subscribed to. If your own detection methods fail, then you would utilise the Infomedia User Detection methods. If the user is detected but not yet acquired, you would send them through the Checkout Pages acquisition/purchase flow. User detection will be handled via the IABLU platform. 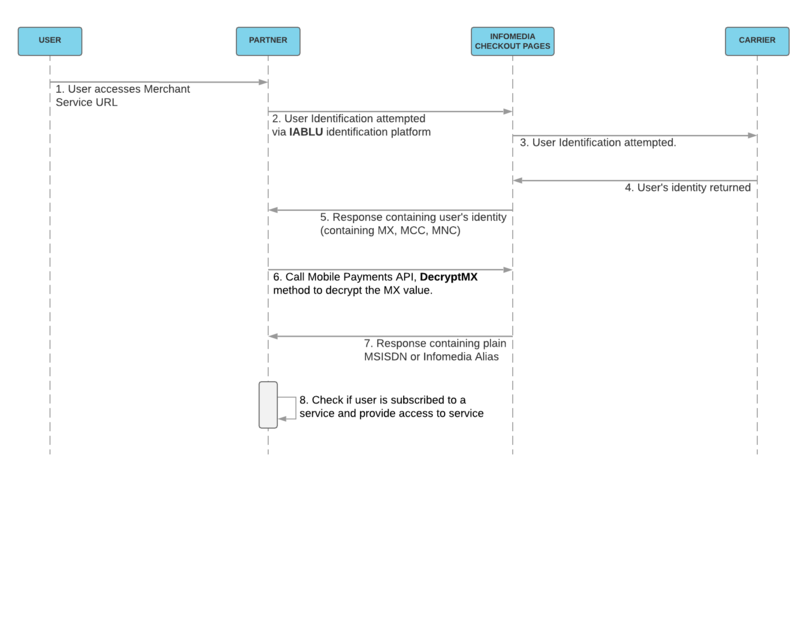 The IABLU flow can be used to retrieve the MX (an encrypted Operator Identification), MCC and MNC details for a user. The user must be browsing whilst on their mobile data connection and not Wi-Fi for detection to succeed. This is done via a process known as Header Enrichment. To decrypt the MX, please call the Decrypt MX method. The MX will contain either the MSISDN or an Infomedia Alias, however the MX should be passed to the API methods instead of passing an MSISDN or Alias. The following PIN flow is an optional alternative way of carrying out user identification, particularly useful when a user is on a Wi-Fi connection and therefore can't be detected via Header Enrichment. You can create your own one-time PIN and send it to a user's device via the Infomedia SMS API. a. SMS API: You would need to generate your own PIN and send this to the user through the Infomedia SMS API via the SendMessageWithCampaign method. Please get in contact with your Technical Account Manager to setup a CampaignID to send an SMS. After receiving the PIN, the user will have to enter this on your platform, where you will have to carry out validation of the PIN against the user's MSISDN that triggered it, before providing the user with access to their service. Make a call to the Subscription Check method to check the status of a user's subscription. If the user has an Active status, they should be given access to their service, otherwise they can be passed through to the Checkout Pages acquisition flow, or to wherever else is appropriate in your flow. This API is split into three parts: MSISDN Identification, Billing and Subscriptions. Several MSISDN Identification methods are available, depending on carrier. These are explained later in the documentation. The Billing section can be used for one-time purchases or for processing recurring payments from a Subscription service managed by yourselves. The Subscription section can be used to Subscribe and Unsubscribe users to/from a subscription service or Check a subscription that is managed by Infomedia. Recurring payments and retry policies. The Infomedia Mobile Payments API has been developed to provide a simple interface for single or re-occuring billing for publishers/content owners to access the network billing solutions of Worldwide Operators. Please use the Stage API endpoint for your integration until you have completed all testing. You will then be given access to the Live API endpoint to have access to the Infomedia production platform. Developers will not be able to access any API methods without a username, password, and the required product IDs. Developers are also required to provide the IP Addresses that requests to the API will be made from so that they can be whitelisted. API access credentials are set up and provided to you upon completion of your Account Setup document. For Product ID setup, please get in contact with your Account Manager. An MX, MCC and MNC, are required for many methods in the Mobile Payments API. If this data is not already known, it can be retrieved by using the following identification method via Header Enrichment. The user must be physically passed to this URL whilst browsing using their mobile data connection and not on Wi-Fi. Once successfully detected, the user's MX, MCC, and MNC will be appended to the QueryString in the ReturnURL provided. The ReturnURL/s must be provided to Infomedia to be whitelisted for the User Identification request to be accepted. The ReturnURL in the request must be URL Encrypted and can include a QueryString of it's own if necessary. The Query String parameters in the table below will be required for a successful identification flow. The descriptions for each flow will indicate if these are required. These are required to be appended onto the HTTP Request detection URL. PT The pass-through value. If provided, it will be returned in the response after identification is attempted. MX Encrypted MSISDN/Alias. This can be decrypted using DecryptMX. MCC The Mobile Country Code. MNC The Mobile Network Code. PT The pass-through value. If provided in the request, it will be returned in the response after identification is attempted. This method returns an MSISDN or Alias from the MX supplied. Status This node can be Success or Error. Description This should be interpreted to determine the outcome. See Status and Description Values for details. MSISDN The decrypted MX will return a MSISDN in international format or an Infomedia Alias. The table below lists Status and Description values that may be found in the response for this API call. Success 00 - Everything was ok This request has been successfully accepted by our platform. Error 00 - Invalid MX No MX parameter was passed in the request or invalid MX or MSISDN was passed. Please correct this parameter and re-try the submission. Error 01 - Invalid login The login credentials are incorrect. Please correct and re-try the submission. Error 02 - Unuathorised The account is not authorised to access this API call. Please contact your Account Manager. Error 06 - Unauthorised IP The IP Address of the client server has not been whitelisted. Please contact your Account Manager. Error 99 - Internal Error Infomedia internal error. Please re-try API. If this failure persists please contact your Account Manager. This call allows the API user to lookup a carrier's Alias for an MSISDN. CarrierAlias This is an ID that we hold which relates to the Carrier's Alias for this MSISDN. Error 31 - No Alias found for this MSISDN No Alias was found for this MSISDN on the Carrier API. This method allows a Partner to check the status of a user's subscription. Status This node can be Success or Error, see below table for further details of failures. SID The Subscription ID that the MSISDN/Alias was subscribed to. MX An encrypted version of the MSISDN/Alias. Success 00 - User is subscribed The customer is subscribed to the service. Error 15 - Invalid SID The Service ID parameter was incorrect. Please correct the parameter and retry. This method allows a Partner to unsubscribe a user from an active subscription. Error 07 - Invalid MNC No MNC parameter was passed in the request. Please correct this parameter and retry. Error 08 - Invalid MCC No MCC parameter was passed in the request. Please correct this parameter and retry. Error 15 - Invalid SID The SubscriptionID parameter was incorrect. Please correct the parameter and retry. For Infomedia-managed subscription services, Partners should setup a URL in the below format to receive asynchronous notifications upon certain events taking place. %%mx%% Encrypted MSISDN/Alias. This can be decrypted using DecryptMX. %%mnc%% The Mobile Network Code. %%mcc%% The Mobile Country Code. %%productid%% The Product ID (PID). %%etid%% An Integer which indicates the type of interaction that has been performed. See the Interaction Types table below. These are the current possible values that may be received via the postback call. Other values are used internally. This API allows you to send SMS messages to users on certain Mobile Carriers. Messages can be scheduled or sent immediately and can be sent in batches or to single users. The API is available as a simple web service and a WSDL is provided. Access is restricted by Username and Password. These will be provided at point of setup. HTTP GET is not supported for this method. HTTP POST is not supported for this method. JSON is not supported for this method. Sends a message to an MSISDN (or list of MSISDNs) with a Campaign ID. Multiple campaigns can be setup to allow SMS campaigns to be split up at the reporting level. Campaigns can be set up when your account is created and then through your account manager when your campaigns are live. 91 There is no account specified for the username and password Check username and password and try again. 92 The MD5 hash supplied was invalid Check the hash and try again. 93 Duplicate feed Check the MessageID and try again. 94 The ScheduleFor DateTime is invalid Change to format yyyMMddHHmmSS or 00000000000000 (for immediate send). SMS asynchronous notifications can be setup for both Infomedia-managed services as well as services managed by Partners using a URL in the below format. Please check the parameter descriptions below to see which parameters apply to your integration type. %%usermsgid%% For messages sent via our Hermes API, this will be the UserMsgID that was provided when the SendMessage call was made. This will be omitted for Infomedia-hosted subscription services. %%campaignid%% The CampaignID that the message was sent through on. For Hermes API users, this will match what was requested. For Infomedia-hosted subscription services we can provide you a list of CampaignID's for you to match against your services. Please speak to your Account Manager for further details. AID Your AccountID. This will be provided by your Account Manager. Alias An alphanumeric Infomedia-created ID which relates to the user's mobile number. CNAME A Canonical Name record (abbreviated as CNAME record) is a type of resource record in the Domain Name System (DNS) which maps one domain name (an alias) to another (the Canonical Name). CSLite The Infomedia Customer Services tool, which was purpose built to handle customer queries, available for Partner use to manage their customer base. DCB Direct Carrier Billing. The method by which customers are billed via their mobile carrier network. IABLU The Infomedia user identification platform which detects users via Header Enrichment and provides an MX, MCC, and MNC, if the user was able to be identified. MO SMS Mobile Originating SMS. These are messages which are triggered from a mobile device, hence 'originating' at the the mobile. MT SMS Mobile Terminating SMS. These are messages which are sent to a device, hence 'terminating' at the the mobile. MX An Infomedia parameter populated with an encrypted MSISDN or encrypted Infomedia Alias. PID The ServiceID or the BPID (Billing Product ID) for the Product that the user is requesting. PSMS Premium SMS. The method of billing a customer by sending an SMS to their device which charges the customer. TXID The Transaction ID for a bill. FAQs for developers to help when integrating with the Infomedia platform. If you require assistance which is not covered in the FAQs, please contact your Infomedia Account Manager. This can differ depending on territory. Please refer to the territory specific Infomedia Framework for more information. Some territories may not allow step-charging at all, so it will not be referred to in the framework. If it is available, it can be found under the 'Retry and Step Charging Policies' section. Unfortuntately not. However, you can enter a PT parameter into the Checkout Pages URL when sending the user to our platform, and that will allow the PT to return to you after the user has completed their flow. This may be the case where part of the acqusition flow is hosted by the carrier and the user has subscribed/purchased but then has been shown a carrier-hosted confirmation page. In some cases, this is a static page and the user may need to click a 'Continue' type button to return through the Infomedia Checkout Pages and onto the Partner's platform. The ideal is for the Partner to host their own subscription/purchase confirmation page, so if this something you are willing to setup, please get in contact with Infomedia to request the removal of the carrier-hosted confirmation page, and instead have the user be automatically redirected to the Checkout Pages platform and onto the Partner's platform. Compliance messages are automatically triggered by the Infomedia platform. For some carriers, you will be able to provide us with the text you require in the SMS and we can configure this. Please contact your Technical Account Manager to configure this. Yes, however there are differing requirements depending on the Carrier and/or territory, please refer to Infomedia Frameworks for more information, and contact your Account Manager to discuss your requirements further. There is no Subscription API for Checkout Pages. Users are subscribed from within the Checkout Pages service and then directed straight to your service content, and therefore all subscriptions are handled by Infomedia. A user's subscription is cancelled if they send a 'STOP'* type MO SMS to the relevant shortcode for a service. If they send STOP along with the service's keyword, e.g. 'STOP YOURGAMES' then that specific service will be cancelled, if they were subscribed to it. However, if they send a different unrelated keyword, or happen to mispell the keyword, e.g. 'STOP SOMEOTHERGAMES' or 'STOP IT', then they will have their most recently subscribed service on that shortcode cancelled, as the 'STOP' request must result in a cancellation. If a user sends 'STOP ALL', then all of their subscriptions on that particular shortcode will be cancelled. Yes, the user's subscription is automatically cancelled by the Infomedia platform if they have gone over the permitted time period/billing cycles without payment. A notification can be sent to your platform upon subscription cancellation taking place. Please refer to the 'Retry Policy' section of the carrier/territory specific Infomedia Framework for more information. Yes, this can be configured for your service by your Technical Account Manager. It is recommended to provide at least a 1 day free period for a subscription service.